At Tek Textil, we specialize in all manner of fabric technology, and get deep into the characteristics of what makes performance-wear perform, and makes specialty garments, well, special. Today we’ll talk about elongation and compression in knit fabrics. First, let’s clear up a misconception that many consumers and even some manufacturers have. And that is more spandex means more stretch. More spandex (being the same type of spandex with same characteristics and curves for stretch, power and elongation), would indicate more power or resistance to stretch. 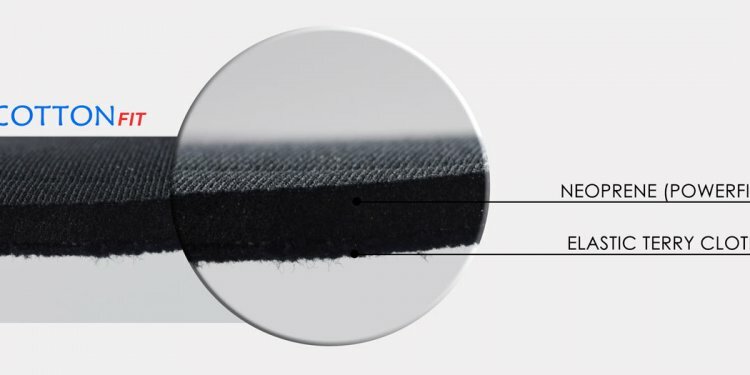 The more spandex you add, either by changing denier (size of the spandex yarn used) or increasing denier, in the fabric by feeding in more spandex, would increase the power. Spandex yarns have far more elongation than rigid yarns (rigid yarns in this case are any yarns used in material other than spandex). So typically, when stretching a fabric, you would never get to the limits of the elongation of the spandex yarn. This means, in most cases, the spandex would not determine the ultimate elongation in the fabric (that determination is made by the rigid yarns in the fabric). I say in most cases, because there are exceptions to this rule, which will become clearer further into the article. Elongation or Stretch – This is the ultimate elongation of a fabric in a particular direction using a predetermined amount of force. Modulus or Power – Some people also like to call this “punch”. This is the resistance to stretch or force that material applies at a particular point of measurement. This measurement is very important when it comes to compression or tightly fitted garments. Recovery -The ability of a material to recover to its original state. This measures if a material can (and if so, how long it takes) to return to its original state after elongating or stretching it. It is measured by elongating and then observing what percentage of its original state it returned to within a certain time period. So now that we know these terms, let’s discuss how elongation is measured and/or determined. In order to measure elongation correctly and have a measurement that can be repeated or correlated, there has to be a determination of how much load will be used to measure the elongation. The load can be specified in bar or lbs. This is the amount of weight or force will be used to pull on the fabric. A good example would be if a grown man was to pull on a fabric with all of his force, he would be able to elongate the material more then a young child. This is because he is stronger and is applying more force when he is pulling. What does synthetic materials means?